This past weekend I flew to Nashville to visit my brother, Nate, and my sister-in-law, Paige. As an added bonus, my parents also drove down from Indiana and joined us for the weekend. Even though the weather was crummy just twenty-four hours earlier (see my previous post about the sixth grade trip), Thursday dawned sunny and clear, and my excitement about taking a mini-vacation mounted. The drive to Austin to catch my flight was uneventful, and I was even more pleased to discover a relatively quiet airport, and a not-full flight. This seems especially remarkable these days. My brother works in the music business as a tour manager so finding pockets of time when he isn’t on the road can sometimes be a challenge. My sister-in-law owns her own salon so her days are full as well. I was grateful to have a long weekend from school, and the chance to spend some time together. Our time over the next three days consisted of eating some wonderful meals (my brother is an excellent cook! ), watching a couple of movies, relaxing, some shopping, and dining at some local restaurants. I was especially looking forward to seeing Paige’s salon for the first time. 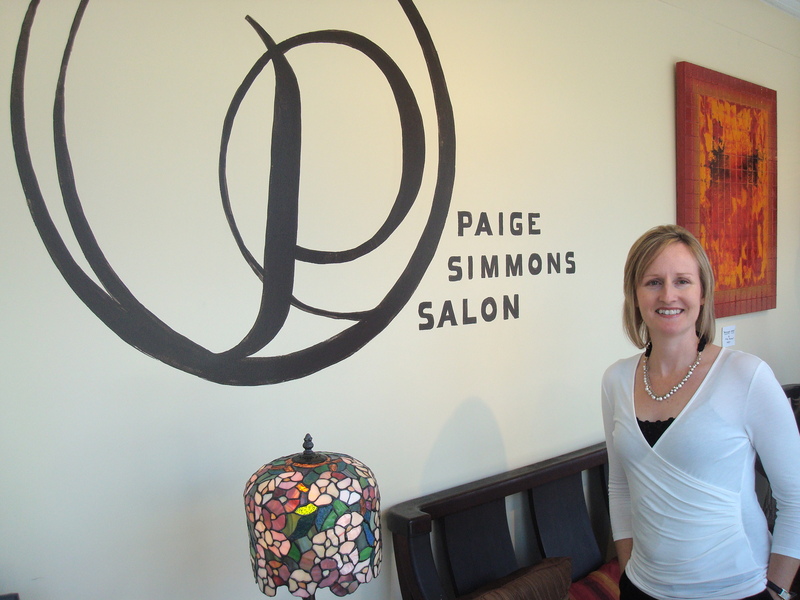 She opened the Paige Simmons Salon in July. Nate and she (along with some help from my parents and friends) rehabbed an old home in Nashville’s West End, and turned it into a lovely salon. Paige has an especially keen eye for good design, and knows how to artfully decorate any room or in this case, a salon. My brother is very handy, and can tear down walls, replace floors, and install all sorts of things. I enjoyed walking through the salon, and listening as Nate described all the changes they made. Paige has clients from all over the place (she was doing a client’s hair who drove from Memphis on Saturday), along with some “famous” clients who shall remain nameless in this post. I enjoyed catching a glimpse of what her life is like at the salon this past Saturday. The time spent with my brother and sister-in-law was another reminder to me of why maintaining sibling relationships is so important. Even though long stretches sometimes occur between visits, I was glad I had the chance to spend some time with my brother this past weekend. As I flew home, I reflected on the many memories I have of Nate visiting our family over the years. Serving in the role of uncle, he has put together toys and tricycles when Jacob and Anna were little as well as eliciting belly laughs and other noises when they were babies. As brother, he helped our family pack our moving truck when we left the Chicago area and drove to Vancouver, and remained calm even though Brad and I were at our wits end. He visited us in Vancouver a couple of times, and helped teach Brad how to snowboard. Finally, Paige and he came for a visit to Waco and caught a glimpse of what our lives look like in Texas. All these memories anchor our relationship, and create a shared experience from which we continue to build and strengthen our relationship. For that, I am grateful. There is nothing like family, and I think we have a special one even as it grows and extends. They are special people that we can count on anytime. Glad you had such a terrifc family mini-reunion!